Because why reinvent the wheel when Desert Beacon has already made it for us. Once again, Ambrose Bierce was correct: “War is God’s way of teaching Americans geography.” In the current instance regarding the Syrian Civil War, hawkish pronouncements may also be a way of inserting a bit of history into the discussion. Those laboring under the simplistic delusion that Vladimir Putin is merely being Petulant Puty on the subject are missing some of the back-story. Syria has a major port. 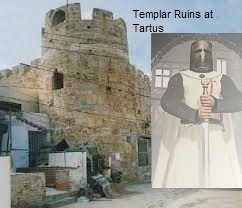 The city of Tartus has been occupied since the 2nd millennium BC, first as the Phoenician colony of Aradus, including Antaradus (modern Tartus.) Crusaders called the place Tortosa, and the Templars constructed their military headquarters there in 1158 including a castle, a keep, and double concentric thick walls. This was insufficient to prevent Saladin from recapturing the city in 1188 and the Templars moved to Cyprus. Russia has a major warm water port at Sevastopol, on the Black Sea.